Whitsunday Island, Queensland, Australia. It is the largest and the most famous island of the Whitsunday Islands group. 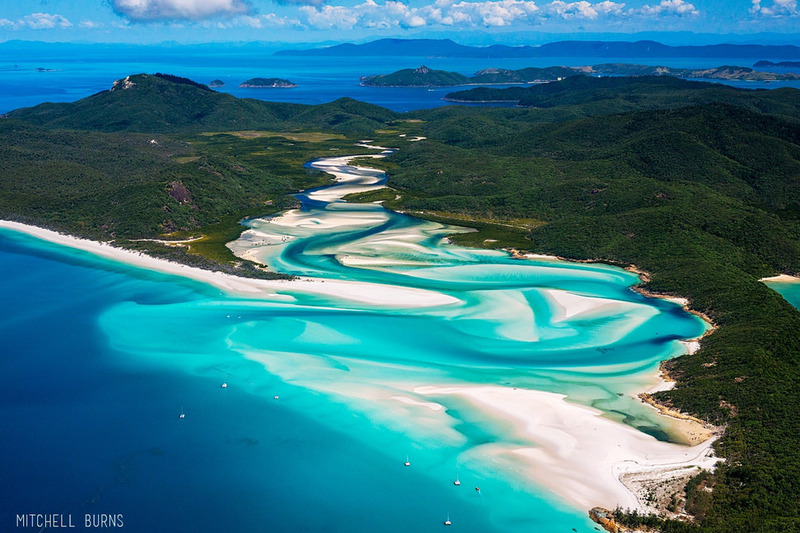 It also features Whitehaven Beach – the iconic and most desirable holiday destination in Australia, which is the synonym of the whole island group. Crystal clear and warm water in the Coral Sea is perfect for bathing and diving. Since the island is found in the middle of the Great Barrier Reef, it has plenty of great diving spots. Cruise trips around the island and air tours are also a popular activity, which enables to explore the gorgeous Hill Inlet – the northern part of Whitehaven Beach, where sand and water create a fusion of colors. One of the greatest places to have a vacation in Australia. The weather is pleasant all year round. By plane get to Hamilton Island and Proserpine. Get around the Whitsunday Islands by boat or bus.